Making the decision to get your numbers – to actually come face-to-face with the facts about your weight, waist circumference, percentage of body fat, blood pressure and cholesterol level – isn’t always easy, but according to Michael Staufacker, director of health management, knowing this information is critical to understanding your health. 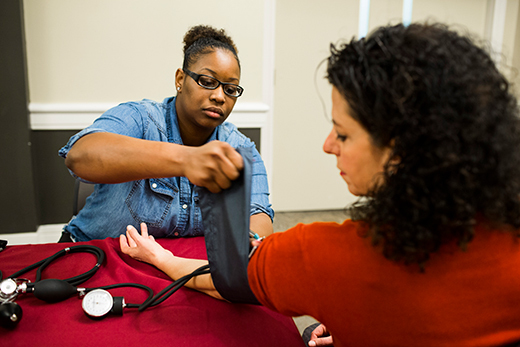 That is why, in January and February, Healthy Emory provided free, onsite “Know Your Numbers” health screenings at 80 different campus locations. More than 7,000 employees of Emory University and Emory Healthcare participated in the screenings, receiving important information about their key biometric numbers: blood pressure, cholesterol, glucose, body mass index and body composition. Leah Casher, an executive administrative assistant with Emory Healthcare, decided to participate because she wanted to get a true number for each of her health measures. “I know how I feel every day, but to visually look at my measurements written down and have a starting point was great," she says. Staufacker notes that by learning their biometric numbers, some employees will be motivated to take further action. “Everyone who participated received information about the numerous health resources that Emory offers, so it’s easy to take the next step,” he says. Screening participants also received a reminder to complete their online health assessment (Aetna’s “Compass”) to learn even more about their current health status and to earn a $150 health plan incentive. A quick look at the exit surveys from the screening events indicates that employees were very satisfied with both the process and the information they received. 99 percent agreed that the screening event was simple to complete. 97 percent agreed that the screening event was a positive experience. 97 percent agreed the screening event was well organized. 84 percent indicated the information they learned during the screening would help them make positive health behavior changes. 98 percent agreed that events such as these are a valuable benefit offered by Emory. If you missed an onsite screening at Emory, there are two other options available to complete your screening and earn your incentive: You can get a screening at your primary care physician’s office or you can go to Emory Health Services. For additional information, visit the Know Your Numbers webpage.